Four fawn colored alpacas pictured with a black and white llama. Alpacas are raised primarily for their luxurious fiber which is often compared to cashmere. Their fiber is similar to wool except it contains no lanolin. It is hypo allergenic and can be dyed many colors. There are two types of alpacas - Huacaya and Suri. Most people are familiar with Huacaya alpacas since they look like Teddy Bears. Suri alpacas have fiber that grows in locks or called pencils much like dred locks. Alpacas and LLamas are members of the camelid family. LLamas can weigh up to 400 lbs and are used primarily as pack animals, guard animals and for their fiber. 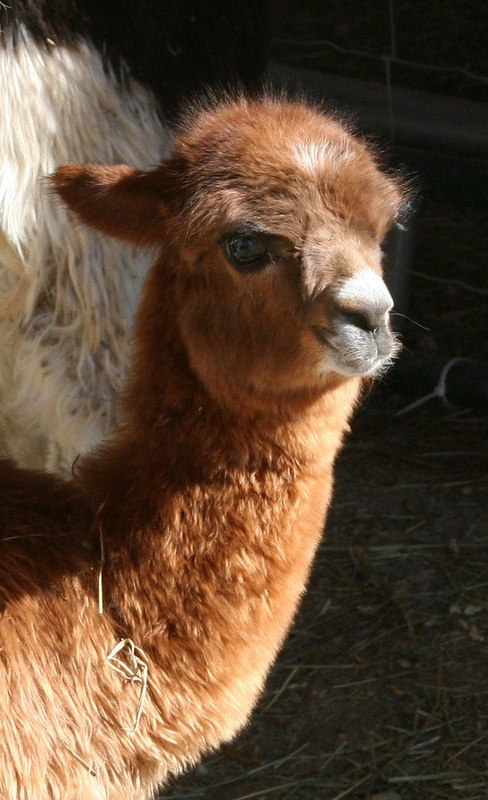 Alpacas are much smaller, raised for their fiber and weigh between 120 - 150 lbs. We shear our camelids every year in late April and process the fiber based on quality. Alpaca fiber is sent to a mill to be spun into yarn for knitting hats, gloves and sweaters. LLama fiber is saved to be carded to make felted hats and soaps or used as stuffing for pillows and dog beds. Please contact us if you are interested in any fiber products that we offer for sale. The first alpacas we purchased were Bee Bop and her daughter Nara. Beep is the matriarch of our herd and all the other alpacas follow her lead when entering or leaving the barn or pasture. She is very refined and gentle and an excellent mother who hums frequently to her offspring. She is pictured here with her latest baby named Alegria. Alegria is the Spanish word for joy and this new daughter certainly brings us a lot of joy. Nara is a daughter of Bee Bop. She is a deep true black with incredible luster to her fiber. At times in the sunlight her black coat appears blue black. Being the daughter of the herd matriarch Nara is very spoiled. She does what she wants when she wants. She is also very athletic and loves to run or pronk around the pasture. She is our smallest and most refined alpaca but produces wondrous silky fiber. Perigee or "Perry" for short was born right after the super moon or the time when the moon is closest to the earth all year. This point in the lunar cycle is called Perigee. Besides his front white socks and neck did you notice he has one white ear and one brown ear? Icelandia came to us from a farm in Oregon. She is our most heavily coated alpaca and very gentle. Because she is very responsive and used to being handled Jay has taken her to work as a therapy animal. Icey loves the attention and enjoys being part of any activity. She has a goofball personality and is sure to make you smile by her facial expressions and friendly disposition. She is completely halter trained and loves to ride in the van. Patience came to us from Ohio. She was already bred to the legendary herdsire named Gunsmoke and within months produced a beautiful fawn male for us. Patience is not the best quality of alpaca but she is very friendly and used to being handled. We sometimes call her Olive Oil since she reminds us of the Popeye cartoon character. Her fleece is very thick and easy to work with. Patience has teeth that grow faster than any we have ever seen. We use a jeweler's saw or a Dremel tool to trim them back each year. 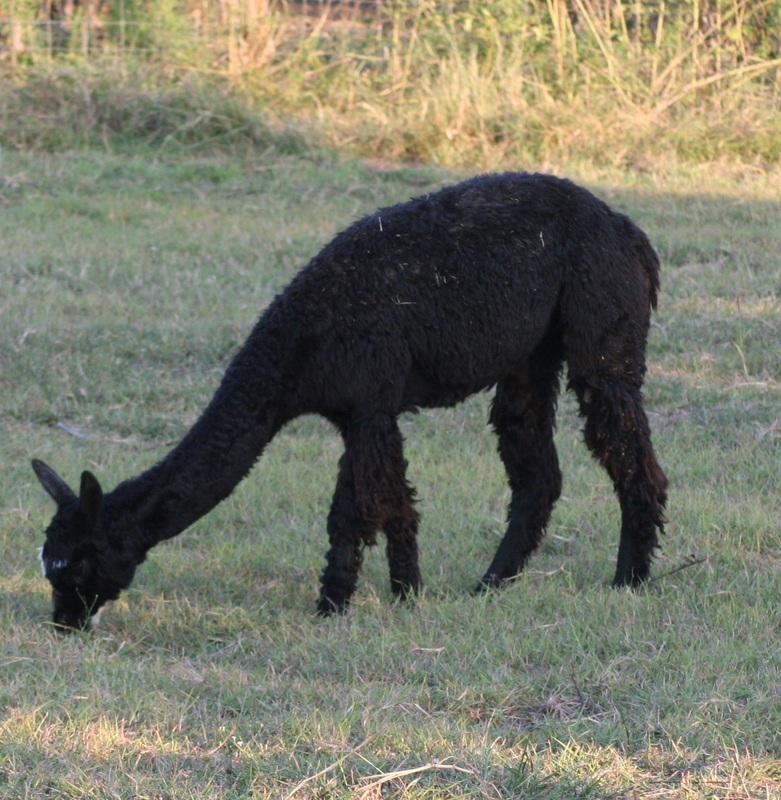 Abu is the son of Patience by Gunsmoke and the first alpaca born at Kumbaya Farm. His full name is Abundance but we call him Abu for short. When he was born he was on his feet within 15 minutes and running around within an hour. We have posted some very entertaining videos of Abu on YouTube - you can find them if you search for Kumbayafarm. Abu is very strong and very masculine but also very friendly. We've been working with him on a halter since he was a youngster so he is very easy to handle. Alpacas don't usually like to be petted but Abu is always available for a neck rub and to check to see if you have any treats for him. This is a photo taken of him around 4 months of age. Othello is a retired herd sire that we acquired from a nearby alpaca farm. He has been gelded and spends time in a separate field with his male buddies Abu and Mattie and male goats Yagi and Sheik. Othello and Yagi are very close buddies. We think Othello is quite a handsome fellow and he produces a very good quantity of some of the most luxurious fiber every year. At times he can be as stubborn as a mule while other times he is very curious and wants your attention. His favorite thing to do is to get hosed down in the late afternoon to relieve himself from the Texas heat. Othello is a bit of a drama king and lets us know how he is feeling by his frequent vocalizations. Baby alpacas are called crias (pronounced cree-ahs). They weigh between 12-20 lbs at birth and can be 20-22 inches tall at the shoulder. They seem to be all legs. The gestation period for alpacas is around 335-345 days - almost one year. One male cria we had was born at 361 days gestation and weighed close to 20 lbs.